ONLINE-ONLY AUCTION. 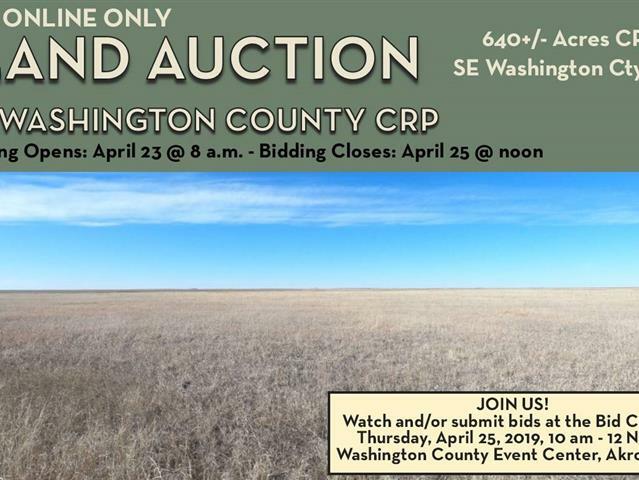 640 acres of CRP land is being offered for sale as the ONLINE ONLY Bidding Opens: April 23, 2019 @ 8:00 am, MT. Bidding Closes: April 25, 2019 @ 12 noon, MT. SE Washington County CRP Land Auction. 628.8+/- acres is currently enrolled in the CRP program with 11.2+/- acres of roads and/or waste. Located from Otis, CO 20 miles south, 2 miles west, 1 mile south or from Anton, CO 5 miles north, 11 miles east, 1 miles north. There are two CRP contracts with 402.9+/- acres enrolled @ $34.66/acre with an annual payment of $13,965 expiring 9/30/2019 and 225.9+/- acres enrolled @ $36.87/acre with an annual payment of $8,329 expiring 9/30/2020. 100% of the 2019 CRP payments to be conveyed to Buyer(s). Possession is upon closing. Seller to convey OWNED mineral rights to Buyer(s). STARTING BID: $400,000.